OmniOutliner is one of my favorite and most frequently used Mac apps. It is indispensable for preparing writing outlines, lectures, talks and project plans. There is plenty of other outlining software (often combined with mind-mapping), but none matches OmniOutliner in its simplicity, elegance and power. 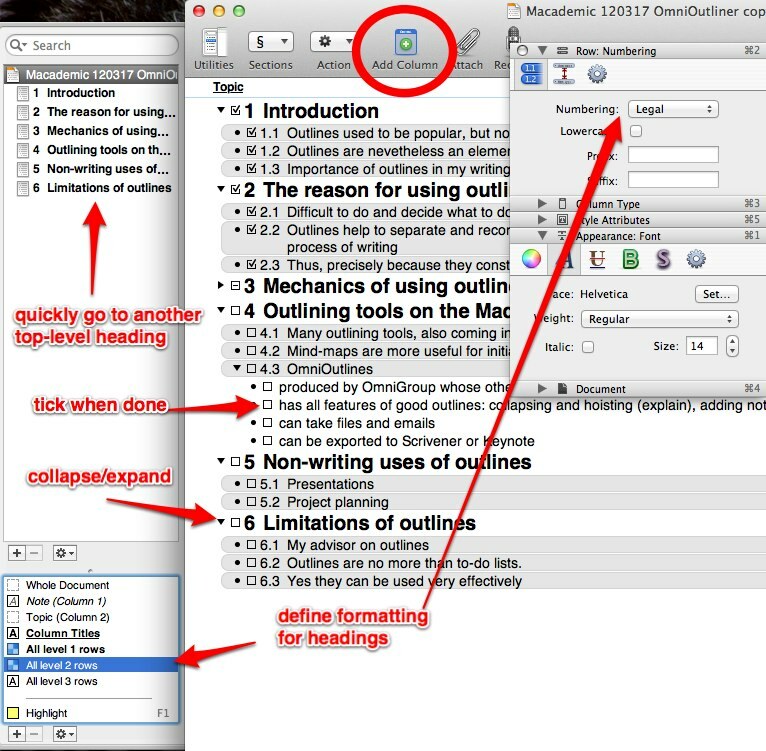 At first sight, OmniOutliner is very simple: you can create headings of different levels, move them around and “collapse” or hide lower level headings to get a higher-level overview of your outline. By pressing ⌘-’ or a little icon next to an entry you can insert a text note related to that entry. There is also a possibility of “hoisting” or displaying only one heading and its children if you want to work with just one part of your outline. This is pretty sufficient for a large part of simpler outlines. But there is much more to OmniOutliner. First, bringing up the Inspector gives you a lot of possibilities for formatting and customizing your outline: from the numbering style of sections to background colors, headings and much more. Secondly, a formatting panel on the left not only contains a “table of content” for your outline, but also allows you to define custom styles depending either on the level of entry (e.g. make all 1-st level headings bold and blue) or associated with a function button. For example, in preparing talks I want to highlight entries associated with pictures in my slides, so I set up F1 to make an entry background yellow and press F1 every time I add a note concerning a new picture in my presentation. OmniOutliner also allows to save outlines as templates and then start new outlines based on an already existing template to avoid starting all this customization anew. I have templates called Writing, Presentation, and Planning. Thirdly, by default OmniOutlines has only one column, but you can easily add other “dimensions” to your outline by introducing additional columns. For example, you may want to keep an outline of your article and track who is responsible for each section. You could introduce a second column called “Responsible” and format it as a drop-down list of names of all co-authors. Another example, for project plans you may want to keep start and due dates of individual tasks. Finally, OmniOutliner smoothly integrates with other software. It’s pretty easy to add a weblink, an email, or attach a file to an outline entry. Outlines can be exported to many formats, particularly useful is the Keynote format (where the top-level headings become individual slides) and the OPML format which is “understood” by Scrivener and many mind-mapping applications. As easy to guess from the names of my templates, I use OmniOutliner for outlining writing, preparing lectures and talks, and project management. This entry was posted in Presentations, Projects and tagged OmniOutliner. Bookmark the permalink. Nice little review on OmniOutliner. Is it easy to rearrange an outline by drag and dropping the headers, or the subitems? Yes, it’s very easy and intuitive. You can do it both with your mouse and through keyboard shortcuts. I’m thinking on getting omnioutliner, however I’m still doubting on getting the Pro version or the standard, is it really worth it? I’ve always done my outlines on simple text files or good old pen and paper, and while it doesn’t have all of the fancy options or tools an outliner does, it does give one a sense of freedom to do whatever you want with it. The thing is, I find omnioutliner a bit expensive, and I really don’t know if I’ll be using it a lot. Any advice? http://www.omnigroup.com/products/omnioutliner/features/#!prettyPhoto gives you a chart comparing the features of Pro and Standard. Of all these features I personally only used Named Templates (e.g. if you want to have different ones for presentations, project planning and writing projects) and Named Styles. I think Standard would do in the beginning though. Can I export my omnioutliner tasks to my iCal? You cannot sync with OF tasks with iCal in Mountain Lion as explained here. You can however easily publish Due reminders so that iCal subscribes to them. It is under Preferences-Sync. A great blog, I keep visiting on daily basis, there’s always something new to learn. I cannot highlight text using the default keyboard shortcuts such as F1, … in the default clippings ? Or there simply is not meant to use them, but afterwards. I am using the Pro version. I purchased omnioutliner several years ago based on the enthusiastic recommendations of others, but I didn’t resonate with it as I had hoped and stopped trying to use it. This post encourages me to try it again for my next project. Would you consider making the three templates mentioned above available? I am eager to read your summary of omni outliner but the beginnin is messed up! Looks like you replaced opening with a section of your very interesting piece on 5 things to keep out of omnifocus, which i was jist reading. I hope you will fix this so i can read about omni outliner. Thanks! I’m wondering if you have any shareable templates or suggestions for Project Planning, Presentations, etc. I’m a soon to be defending PhD student in London Canada, and also a Project Coordinator at a not-for-profit government funded research organization. Pingback: In A Digital World Is There Still A Place for Pen & Paper? Thanks Aleh, I am a fan of using OmniOutlier. The advice you put here introduced some cool options and usage of OmniOutliner. I have a question for you, did they remove the Keynote export option? I could not find it in the dropdown menu there is the option. Please advise.and I wish you every success in the teaching career. Yes, Alex it seems so.